Some understanding of very basic programming concepts will be useful for the more advanced parts of the session, but is not expected. I.e. // which accepts a parameter "radius". // Declare a variable called "area". // The area variable is now NULL. // Now assign a value to area. // area becomes 2 times pi times radius. // The area variable is now 2πr ("two-pi-R"). // Functions usually return something. 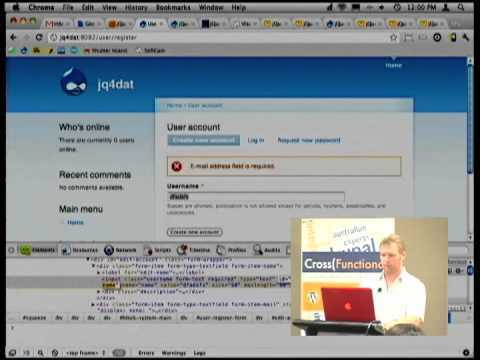 This session is based on the jQuery for Designers and Themers theme, which was created and upgraded for previous Drupal events where I gave this session or variations of it. Based on audience feedback from those sessions, I have refined the session content and adapted it. Sample code is at Drupal.org/Project/jQ4DaT. Slides are at TinyURL.com/jQuery-Designers (Google Docs). They will be updated and refined. Audio from DrupalCon SF. Audio is high quality, but video contains slides only. Sorry I forgot to repeat the questions into the microphone. Video from DrupalCon Paris. It is a very poor quality recording. Good, clear presentation style and content.